I think that people should already know by now that if something goes wrong, it is NOT THIS RECIPE'S FAULT. This is a perfect recipe, it works, and it's just plain right. After reading some of the reviews, there are a few common problems amongst them. 1) Do not use COLD MILK. Start with warm milk. Heat up the milk before using it. Cold milk will only result in something that doesn't puff up during the cooking process. If you need to, melt the butter in the milk, that way your butter doesn't chunk up on you in the batter when the milk is cold. 2)Do NOT over mix your pancake batter! You will end up with FLAT and HEAVY pancakes. You need to mix it just enough, to where all your liquid ingredients are absorbed in the flour, but there are still lumps. The batter should almost look like it's "rising" with bubbles sort of. Beating up your pancake batter means beating up your family with bad pancakes. I'd like to add that the last pancakes out of the batter are going to be tougher than the first batch that came out. As the ladle goes in and out of the batter, that is working the gluten in the flour. 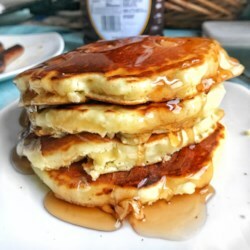 Try to use an extra large ladle or scoop, so you can scoop multiple pancakes in one go, reducing the amount of times you dip into the batter. This helps ensure that all your pancakes will stay uniform and tender.